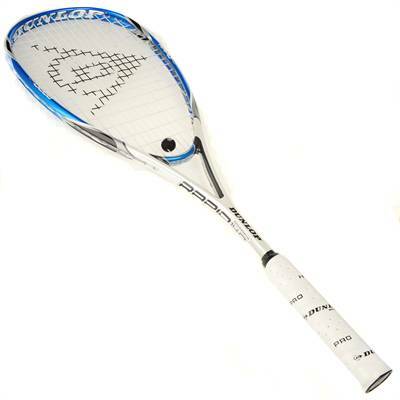 The Dunlop Rapid 140 squash racket is an ideal frame for players seeking the largest permitted head size and slightly more weight in the racket head to deliver maximum power enhanced by the Power-Ridge throat design. The larger head shape ensures that even off-centre shots will not be punished and offers the player the best of both worlds, power and technology to improve control, within a more forgiving frame when required. The Rapid 140 is a popular choice of frame and especially suited to the player who is looking to take their game onto the next level. Power-Ridge technology reinforces the racket throat area to deliver increased stiffness stabilising the racket head at ball impact thereby improving power. M-Fil is a combination of three materials that are incorporated into the hitting zone of the racket head to enhance the touch and feel of the racket where and when you need it most - at the moment of ball contact. The 3D Braided structure at these key points enhances torsional stability at ball contact while frame deformation is similarly reduced and this helps to enhance dwell time on ball impact.